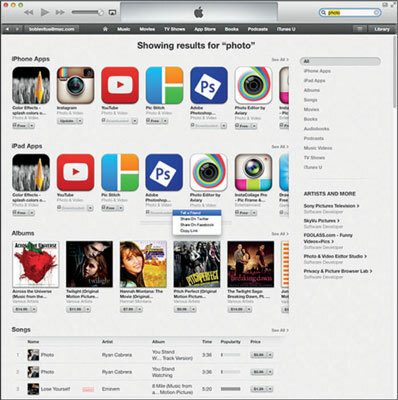 Click the iTunes Store button near the upper-right corner of the iTunes window, or click iTunes Store in the sidebar. If the sidebar isn’t showing and you’d like it to show, choose View→Show/Hide Sidebar or press ⌘+Option+S (Mac). Either way the result is that you’ll be looking at the landing page of the iTunes Store. Click the App Store link. The iTunes App Store appears. If you wish to look at a specific department of the App Store, instead of clicking, press and hold on the App Store link and select a department from the drop-down menu. (Optional) If you want to look only for apps designed to run at the full resolution of your iPad, click the iPad tab at the top of the window. Now you’re ready to browse, search, and download apps. 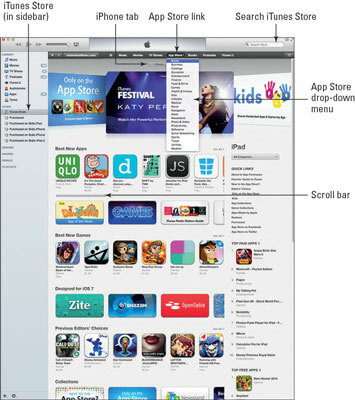 After you have the iTunes App Store on your screen, you have a couple of options for exploring its virtual aisles. The main departments are featured in the middle of the screen, and ancillary departments appear on either side of them. The Best New Apps department displays icons that represent apps that are — what else? — the best new apps according to Apple’s curators. Only six icons are visible, but the Best New Apps department actually has more than that. Look way over to the right of the words Best New Apps. See where it says, See All? Click that link to see all apps in this department at once. Or click and drag the scroll bar below the icons to see more. The Best New Games department displays icons representing the best new games available today. Again, you can see more of these icons by clicking the See All link or dragging the scroll bar. The Previous Editors’ Choices department appears below the Best New Games department. These are apps that were featured previously in a “best” category. Same deal here: See more by clicking See All or dragging the scroll bar. Apple has a habit of redecorating (or even reconfiguring) the iTunes Store every so often, things may not be exactly as described here when you visit. Separating the Best New Apps department and Best New Games department are ads, with more ads between the Best New Games department and Previous Editors’ Choices department. Click an ad to learn more. Three other departments appear to the right, under the Top Charts heading: Paid Apps; one of our favorite departments, Free Apps; and Top Grossing Apps. The number-one app in each department displays both its icon and its name; the next nine apps show text links only. Type a word or phrase into the Search field in the upper-right corner of the main iTunes window. Press Return or Enter. If you search for photos, you see results for the entire iTunes Store, which includes music, television shows, movies, and other stuff in addition to iPad apps. Among your search results, find the category for iPad Apps. Because the screen displays results from Albums, Songs, Movies, TV Shows, Music Videos, and more, you might have to scroll down to see the iPad Apps section. Fortunately, you can also easily filter by media type. Just tap iPad Apps in the list near the upper-right corner of the screen, and everything but iPad apps disappears from the screen. Sweet! Click the See All link to the right of the wordsiPad Apps. All the iPad apps that match your search word or phrase appear on a single screen. The little triangle to the right of each item’s price is another drop-down menu. This drop-down menu lets you give this app to someone as a gift, add it to your wish list, send an e-mail to a friend with a link to it, copy the link to this product to the Clipboard so that you can paste it elsewhere, or share this item on Facebook or Twitter.